Areka offers customized solutions, whatever the profile of your company and travel program. SMEs and major corporations. We work with companies ranging in size from €5 million to €500 million in travel spend. All industries. Our clients include both private and public-sector organizations in a wide variety of sectors. Travel programs at all stages of maturity. We bring value to all kinds of, whether you are in the early days of building a travel program or going the extra mile to improve long-standing processes. Worldwide. 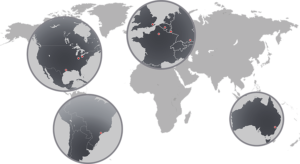 Areka’s local experts help clients wherever you are located around the world. Our team is based in Asia Pacific, Europe, North America—and growing fast. Diverse outsourcing needs. We adapt to your organization, whether you require ad-hoc support or a long-term partnership, behind-the-scenes analysis or a more comprehensive outsourcing role. The quality of our analyses and our commitment to you remains the same. Base recommendations on hard facts and quantitative analysis so that your organization can take informed decisions. We back up our conclusions with granular data enabling you to make a strong case for change. Implement rigorous project management with clear timelines and resource allocation. This is key to meeting objectives and ensuring smooth implementation. Guarantee a global response to your needs. Wherever you are based and whatever the scope of your program, Areka acts as one team worldwide. Transfer knowledge to our clients, providing you and your organization with long-term benefits as our partnership grows. Help you gain traction for your program by working with you to involve top management and build support throughout your organization.